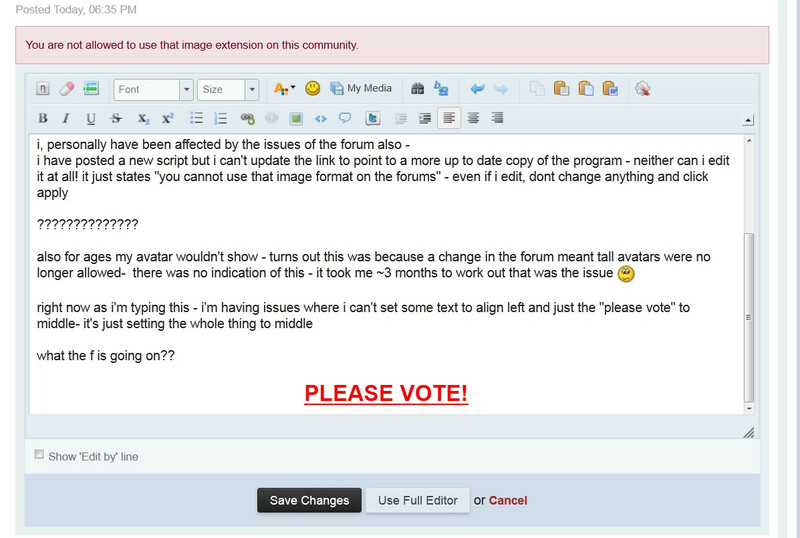 This is one of worst forum bugs, it makes people think that no one cares about their posts. I am sure this drives many potential users away, with great detriment to the community. This is especially detrimental to the Help forum. Having a help request sit for a week with no views probably causes some potential users to just give up. Yes I was in fact if I'm honest thinking of changing of language because that, I thought, nobody here has interest I what I'm asking or trying to do, but first I decided to not because AHK it's, by itself, such a great language, for certain things (for example for doing Maths Matlab code you can't beat, but for automation, this program should be by far one of the best) that I decided to keep, even w/o all the support I expected, and then if I see this I understand it better. also for ages my avatar wouldn't show - turns out this was because a change in the forum meant tall avatars were no longer allowed- there was no indication of this - it took me ~3 months to work out that was the issue. what the f is going on?? Trouble is, polyethene isn't going to read these posts. When was the last time anyone saw him in the forums? There is a reason why he has his last active status set to private; he is never here as far as I can tell. We may have reached a point were evolution is no longer effective. Revolution may be the only answer. which it shouldn't be- surely the administration should be "on the shop floor" (for a better term) - easy to access/communicate with and active in their community no? seriously, this stuff has been complained about for 6+ months. do you really expect this post to make any difference? But I don't understand all of this. Isn't the difference btw AutoHotkey and AutoIt that the first one is open source and the second not? Why we keep waiting that "God" Poly is this program is suppoused to be community based? It's due to histrorical reasons - these is a quite lengthy story. In the beginning Chris Mallet created AutHotkey - the AHK world was happy and unified. Later on Chris lost his motivation on further developing AHK - but the created world turned on. A few derivates of AutoHotkey arose, as there have been AHK_L by Lexikos and a few more variants - this led to a more or less splitted community with fiercy battles between AHK and AHK_L for example. Chris continued to retire from AutoHotkey, but as the creator of AutoHotkey, he still was the "highest" authority (as he maintained for example the domain www.autohotkey.com ...). Chris once realized that it's time to pass on the baton to keep the things going on. He took a look at the community to get appropriate successors (experience, reliability, activity ...) and presented candidates to the community and asked for volunteers. The end of the story was that Polyethene (yes - he had a good reputation within AHK community - and yes, he once was relieable and active ...) and a second person were chosen to be the successors. The main goal in the beginning was a reunification of the splitted AHK/AHK_L community and a modernization of the forum. But the two successors had different ideas of the way how to do it. After a while Polyethene decided - without consulting anybody (?)) - that it's time to show some activity. With a hush-hush operation he introduced the new forum software (as it is now) and proclaimed classic AHK as the one and only AHK, letting AHK_L just being a subordinate variant. Therefore the second nominated successor lost all his influence and was practically closed out with this coup - at last consequence he lost his motivation and retired completly from AHK (BTW: Has anybody heard anything from him lately?) Especially declaring classic AHK as successor of classic AHK led to some resistance among enthusiastic AHK-forum members, as classic AHK was a dead development with a few quirks, whilst AHK_L was a vivid development implementing some new ideas based on Lexikos and community ideas. An open letter was written to Polyethene which caused Poly to accept AHK_L as official successor of AHK ... Since then, Polyethene seems to be gone. * The community still struggles with the consequences of the historical split of AHK and AHK_L ..
AutoHotkey is theoretically community based. Practically AHK_L is open sourced and maintained by Lexikos, with very little community participation. I would add that he moved the working German Forum here. There was now announcement in the German Forum until IsNull noticed it.